The Mitsubishi Outlander Sport has received an IIHS Top Safety Pick award four years in a row! Adventuring into the unexplored is easy when you are in a vehicle as safe and reliable as the 2015 Mitsubishi Outlander Sport, so go ahead and take on the back-roads! Learn more about the sporty, adventurous 2015 Mitsubishi Outlander Sport at Carriage Mitsubishi today! The 2015 Mitsubishi Outlander Sport operates on a 2.0L MIVEC DOHC 16-valve Inline 4-cylinder engine generating 148 horsepower and 145 lb-ft of torque. For an SUV, the 2015 Outlander Sport has an impressive fuel economy. The Outlander Sport achieves up to 32 mpg highway and 25 mpg city*. The 2015 Mitsubishi Outlander Sport is now being offered with even MORE power! The Outlander Sport ES and GT models are getting a boost under the hood, which will include a new, larger 2.4-liter MIVEC 4-cylinder engine, raising the horsepower in those models from 148 to 168 horsepower! The Mitsubishi Outlander Sport 2.4 ES will be slightly different than the base ES model. It will have a black center bumper, black roof rails, and outside mirrors with LED turn indicators. On the inside, the Outlander Sport 2.4 ES will feature a power driver’s seat, aluminum pedals, and a leather-wrapped parking brake handle. The optional GT Premium Package includes a premium sound system, a panoramic glass roof, an auto-dimming rear-view mirror, and LED mood lighting. Upgrading to the Touring Package adds leather seats and a Navigation system with a 7-inch high-def. touchscreen, real-time traffic, 3-D mapping, and point-of-interest information. To be able to handle the back-roads and off-road adventures, you have to the have the exterior built to handle the back-roads and off-road adventures! The 2015 Outlander Sport has amazing standard features including: halogen headlights, rear LED combination tail lights, side fender turn-signal indicators, color-keyed front and rear bumper, side-view mirrors, and outer door handles, roof carrier plug-in accommodation, chrome grille surround, heated side view mirrors, rear privacy glass, aero wiper blades, 18-inch alloy wheels, and a space saver temporary spare tire. Although you might be taking your Outlander Sport on some exciting adventures, the interior is sure to keep you comfortable and entertained, no matter where you go! Some of the standard interior features include: a color LCD multi-information display, high-contrast meter gauge cluster, 5-passenger seating, fabric trimmed seating, a leather-wrapped steering wheel and shift knob, a carbon design audio panel, an AM/FM/CD/MP3 audio system with 4 speakers, FUSE Hands-free Link System® with Bluetooth® technology, USB port, and steering wheel-mounted controls, remote keyless entry with panic feature, and cruise control. 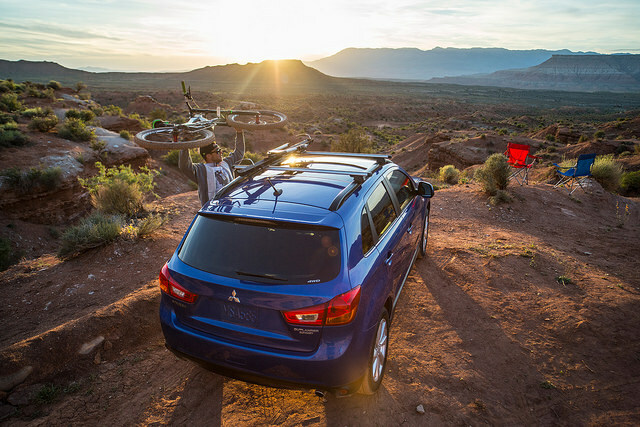 Some of the standard safety features on the 2015 Mitsubishi Outlander include: Hill Start Assist, Anti-lock Braking System (ABS) with Electronic Brakeforce Distribution (EBD) and brake assist, Active Stability Control (ASC), Traction Control Logic, Tire Pressure Monitoring System, 7 standard airbags including drivers knee airbag, advanced dual-stage front airbags with driver’s seat position sensors, 3-point seatbelts and head restraints for all seating positions, LATCH system with child safety door locks, an anti-theft security alarm system and engine immobilizer, RISE body construction, side-impact door beams, and a collapsible steering column and foldaway brake pedal assembly. Be sure to stop into Carriage Mitsubishi to test drive the all-new 2015 Mitsubishi Outlander Sport today! With our large inventory, our team here at Carriage Mitsubishi loves helping our customers find the perfect new car or used car for them! Please feel free to contact us if you have any questions or would like to schedule a test drive!